After a couple of weeks in the UK visiting friends and family and I have just returned to Rome with a fresh hoard of flea market and thrift store vintage action figure finds! By pure chance, on this trip to Blighty I also happened upon some quintessentially British action figures too, which I'll share over the next few blog posts. When the BBC revamped their cult sci-fi classic Doctor Who show in 2005 with producer and writer Russell T Davies at the helm, the series – along with spin-offs Torchwood and The Sarah Jane Adventures – was filmed on location in and around Cardiff. I was staying with my sister just outside the Welsh capital city for much of my visit, so was extra delighted to score this fabulous 12 inch Cyberman action figure in the spiritual home of Doctor Who! As persistently pesky enemies of The Doctor, only the Daleks can really rival the Cybermen, those scary cyborgs that have been forcing kids into hiding behind sofas since their debut on the show in 1966 alongside the first actor to play the Doctor, William Hartnell. 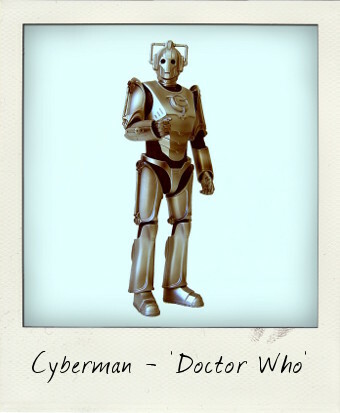 In the 2006 two-part story starring David Tennant as the Tenth Doctor - Rise of the Cybermen and The Age of Steel - the Cybermen were reintroduced in spectacular fashion as the brainchild John Lumic, the crazed head of Cybus Industries, and it is this new, revamped Cyberman that is commemorated with this 1/6 scale action figure made by British toy company Character Options. Nicely chunky, this figure feels solidly built and with 14 points of articulation has plenty enough play and pose potential. 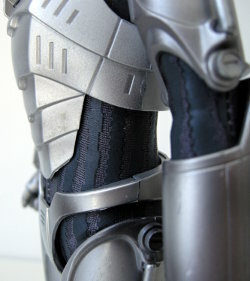 The attention to detail is extremely accurate – I love the built in gun-arm detail on his right arm, as well as the textured fabric under-suit beneath the shaded battle armour. The only thing missing, I suppose, in a figure of this size, would be the ability to have him light up or, even better, say those chilling words: You will be deleted! Delete! Delete! Delete! All in all, a great piece of TV memorabilia and a must-have piece for any Doctor Who action figure fans. Very cool figure.Solid!He kind of looks like something out of D.C. comics.